A John and Henry Sorby Plains Indian Dagger with buffalo horn handles. This original dag knife was sent to me by a private collector who has written books on Plains Indian weapons. The weapon was damaged sometime during its life and the collector wanted the knife to look like it had a 200 year old repair done by its original owner. Indians were experts at melting down bullets and making lead or pewter repairs. Therefore, I opted for a pewter band, simple with no decoration. This dagger is an early knife, dating after 1827. 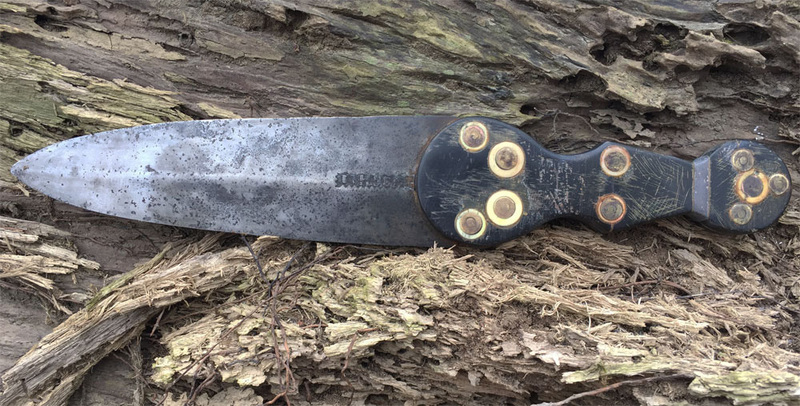 According to documentation, the blade was made in Sheffield England. This knife was most likely handled by an Indian as the handle slabs are buffalo horn. My part of the repair was to fix the broken lollipop end of the handle (farthest away from blade). Sometime in its life, the knife was dropped on the end of the handle which resulted in cracking of both horn slabs at their juncture to the rest of the handle. In fixing this break, I opened up the crack and made it even on both sides of the knife. The broken part of the handle was loose as it was only held with a single rivet. To tighten it up, I made two iron wedges, slid them under the horn, wedging both sides tight. Then, to finalize the repair, I slightly notched the tang of the knife and poured a pewter band to lock all components of the handle and tang together. The band was patinaed and aged to assimilate an old repair, as my client requested. Click here to view another repair of an original.